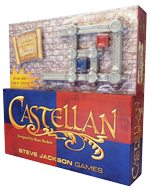 August 12, 2013: Finally, Castellan! It's hard to describe the feeling of finally seeing a game you have been playing for a few years finally get into the public's hands. It's weird for me to think of it as "new," and yet it is. Many of you have already played it, quite possibly with me, and enjoyed it despite what was surely a devastating loss at my professional hands. I almost feel like I'm from the future. I have years of experience at a game that has just come out. As a gamer from the future, let me tell you, Castellan is lots of fun. Pick it up! You are already years behind me; you can't afford to lose any more time.